When my mom asked me to make a special cake for christmas, I was thrilled to bake something really special and out of this world. As you may or not may know I study in Milan and most of the year I’m over there away from my family. That’s why my parents don’t get to taste any of the cakes I make in Milan. So now that I’m in my hometown I’m going to use all the free time I have to bake. I really wanted to impress my mom with the Christmas cake. So I immediately went on Linda Lomelino’s blog ( you all know by now how much I love her) and searched for a spectacular cake. 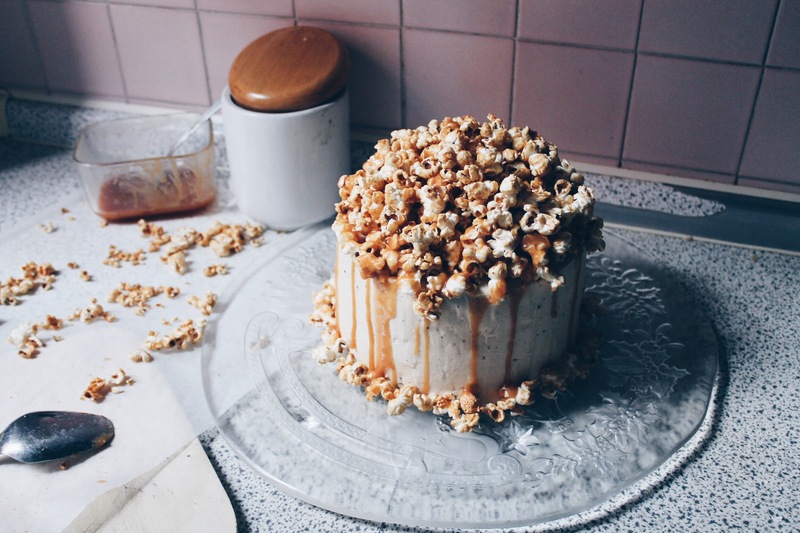 That was when I came across her pop corn cake. Yep, you read it right. 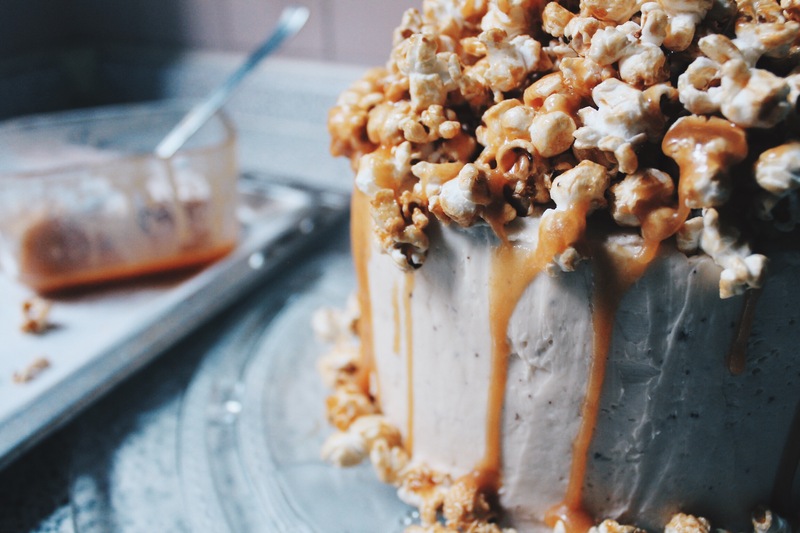 A chocolate cake with swiss meringue salted caramel frosting and crunchy pop corn on top. Oh my god. I was so amazed by it that I immediately took the challenge. Honestly the cake in itself is not difficult to make. But the buttercream was quite the challenge. The only advise that I feel like giving you when making this cake is Have faith. Every five minutes, while making the cake, I was thinking: Oh my god, there is something wrong here and I have no idea how to fix it. But it wasn’t true. I’m going to guide you every step of the way and if you follow word by word this recipe you’ll end up with the most amazing, good looking and tasty cake you have evr seen and hopefully eaten. N.B my pan is 18 cm. If you wish to make your cake in a bigger pan double the recipe. Preheat oven to 350°F (175°C). Butter and flour two 18 cm baking pans. Melt the butter and let it cool. Sift the flour, cocoa powder, baking powder, baking soda, sugar and salt into a large bowl. Add eggs, milk, coffee and butter and stir until batter is smooth. Divide the batter between the baking pans and bake for 30-35 minutes or until a cake tester comes out clean. Let the cakes cool in their pans before you turn them out onto a cooling rack to cool completely. Heat granulated sugar in a medium saucepan over medium heat, stirring constantly with a high heat resistant rubber spatula or wooden spoon. Sugar will form clumps and eventually melt into a thick brown, amber-colored liquid as you continue to stir. Be careful not to burn. Once sugar is completely melted, immediately add the butter. Be careful in this step because the caramel will bubble rapidly when the butter is added. Stir the butter into the caramel until it is completely melted, about 2-3 minutes. Very slowly, drizzle in 1/2 cup of heavy cream while stirring. Since the heavy cream is colder than the caramel, the mixture will rapidly bubble when added. Allow the mixture to boil for 1 minute. It will rise in the pan as it boils. Remove from heat and stir in 1 teaspoon of salt. Allow to cool down before using. Pour the egg whites and sugar in a clean and heat proof bowl. Put the bowl over a saucepan with simmering water. The bowl should fit snugly, and the water should not be touching the bowl. Whisk the sugar and eggs with a whisk constantly until the mixture reaches about 65°C. If you don’t have a sugar thermometer, just rub some mixture between your fingers. If the sugar has melted and mixture is hot to the touch, it’s ready. Remove the bowl from the heat, beat until white, fluffy and cool with a stand- or electric mixer. This step can take about 5-10 minutes. When the bowl feels cool to the touch, start adding the butter, piece by piece. Don’t worry if the mixture looks curdled and soupy just keep beating until smooth! Add the caramel and beat until smooth. Preheat oven to 300°F (150°C). Make the popcorn according to the instructions on the bag. 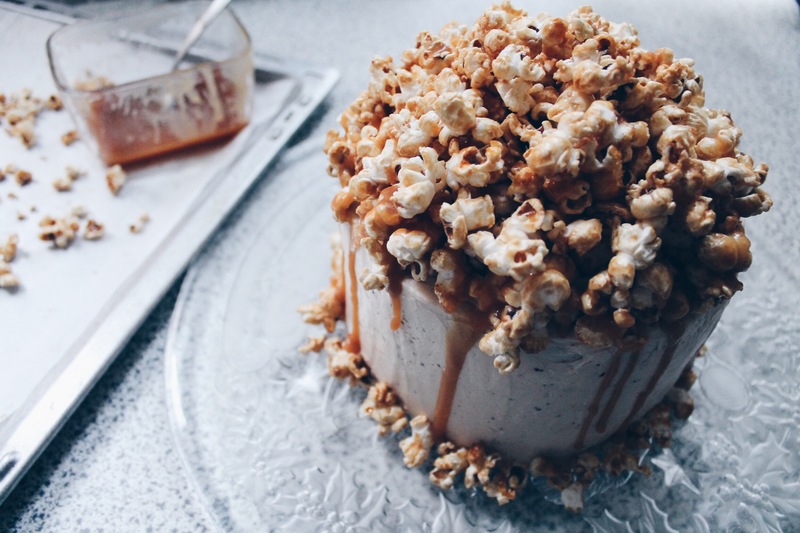 Put half of the popcorn and the caramel (if the caramel is too thick, heat it for a few seconds in the microwave) in a bowl and stir until the popcorn is coated with caramel. 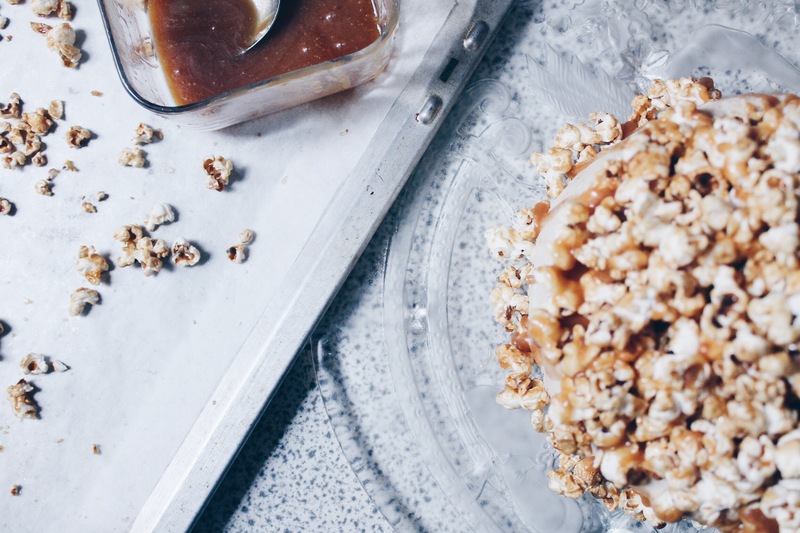 Spread popcorn in a single layer on a baking sheet covered with baking paper. Bake the popcorn for 15 minutes, stirring a couple of times. Remove baking sheet from the oven and leave to cool. If cakes are rounded on top, even out with a knife. Cut both cake layers in half using a sharp serrated knife (you’ll end up with four thinner layers). Put the first layer on a cake board or a cake stand. Spread buttercream on the first layer. Add the next layer and repeat until you’ve used up all four layers. Spread a thin layer of buttercream all over the cake using an offset spatula. Put the cake in the fridge for about 10 minutes or until the crumb coating layer has firmed up a bit (leave the bowl of frosting in room temperature). Spread the remaining buttercream all over the cake until cake is smooth. For a totally even and smooth surface, dip an offset spatula in warm water and dry it between every pass. 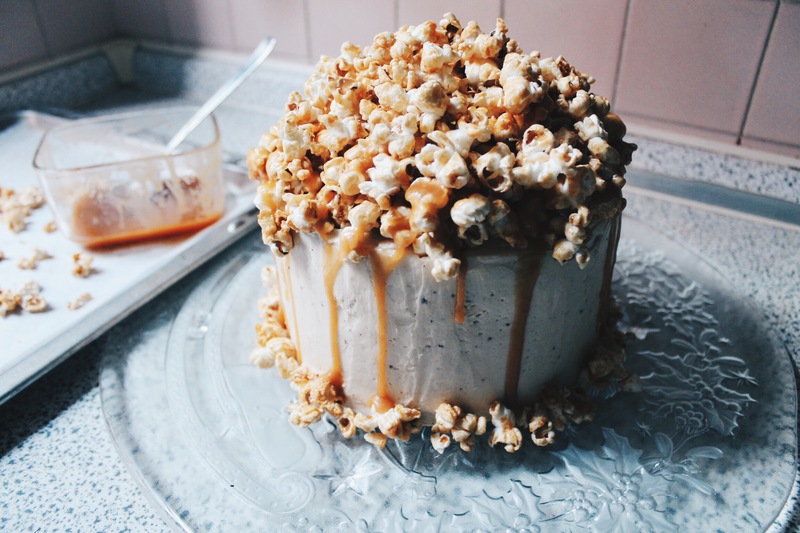 Put the crunchy popcorn on top of the cake and pour remaining caramel sauce over. I hope you guys have enjoyed the recipe. Let me know if you try it! Thank You so much! Let me know if you make it!